Combined heat and power (CHP) is a process that provides both heat and power on site in one single, highly efficient process. CHP generates electricity and as a by-product of the generation process, heat is produced. This heat can be used on site while using the power generated. In contrast, our traditional coal and gas power stations can loose up to two thirds of the heat produced. By generating the heat and power on site, CHP systems can acheive in excess of 80% efficeincy. Wood Biomass is fed into the system similar to a normal biomass boiler. Instead of feeding it Oxygen to burn the fuel, it is heated in an environment that has no oxygen present. 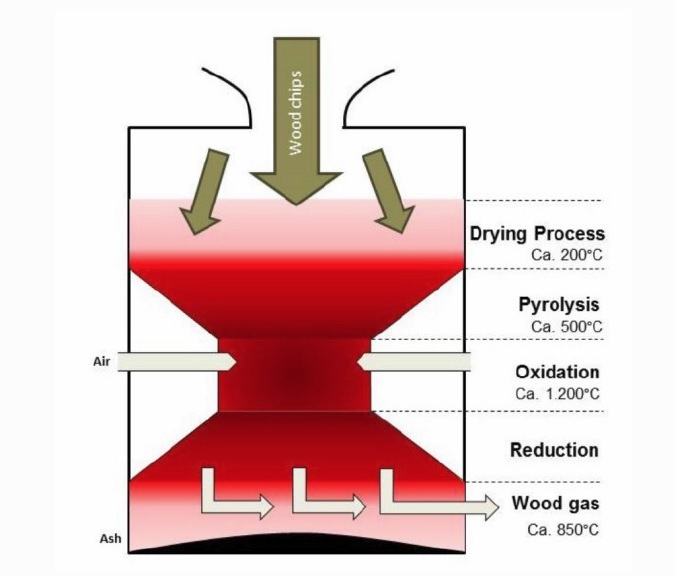 At around 700 degrees Celsius, all the gases from the wood are extracted and instead of being burnt, run through cooling coils and filters that produce a synthesis gas or Syngas. The gas is then fed to an engine that runs on the gas. Connected to the engine is a generator to provide electricity and the heat produced by the engine, instead of going to a radiator, can be fed into a heating system. This rewards people for generating heat from a renewable heat source such as biomass. A heat meter is placed on the system that records generation and the government’s scheme pays the owner of the equipment a certain tariff depending on the technology and size. Biomass boiler installations over the last 5 years have boomed with the introduction of this tariff. The RO scheme was initially implemented for large power generators using alternative fuel sources. For every 1000kW of energy generated, the scheme issues certificates. These certificates are bought by the energy supply companies so they meet the government criteria on having some of their energy generated from renewables. Biomass CHP systems, including the system supplied by TW Power, are classed as advanced combustion technologies and gain the highest certificate value for the energy generated. Installing a BiomassCHP system will dramatically improve the Environmental impact of your premises, reducing your use of fossil fuels and reducing your carbon footprint. This is a very valuable public relations story for your customers who will be increasingly aware of global warming and the need to work with companies with impressive Green credentials.